As I’m about to go to the pub for a drink with a few tight friends (I’d like to call them frugal but they’re not they are just tight) this gadget seems pretty appropriate, the Whose Round Is It Anyway? game. The game works like Simple Simon but instead of having to remember colors you need to remember drinks. The loser is the first person that fails to remember and repeat all the drinks and they’ve got to buy the next round (I made the last bit up but it does kind of work, though you may get the odd strange glance if you sit in the corner playing this all evening). The Whose Round Is It Anyway? is available from Gadgetz4All for £12.95. this sure is going to make any drinking session quite interesting! 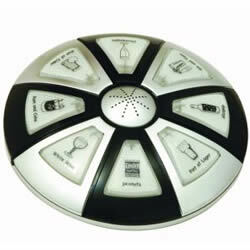 where can i purchase who’s round is it anyway game in the US.or from the UK.